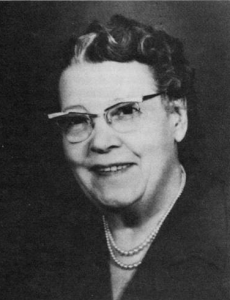 Dr. Sadie Lindeberg provided medical care to generations of Miles City women. Photo from “Custer County Area History: As We Recall,” p. 377. Dr. Sadie Lindeberg of Miles City had an exceptional career by any standard. She became a doctor in 1907, a time when there were perhaps as few as three women physicians in all of Montana. She practiced well into her eighties and delivered, by her own count, over eight thousand babies in a career that spanned more than half a century. These accomplishments alone make Lindeberg a notable figure in Montana history, but her work helping girls and women through unwanted pregnancies—at a time when pregnancy out of wedlock was shameful and abortion was illegal—makes Dr. Lindeberg’s story truly extraordinary. Born in 1884 to Swedish immigrants Nels and Hanna Lindeberg, who homesteaded a few miles west of Miles City, Lindeberg claimed to have been the first white baby born in the area. Sadie graduated from high school in Miles City in 1901. After working for a few years as a substitute teacher, she enrolled in medical school at the University of Michigan. Graduating in 1907, she took a yearlong internship at the Women and Children’s Hospital in Chicago, then returned home to establish a private practice.